First place a fine-mesh sieve over a medium bowl; set aside. In a medium saucepan, off heat, whisk together sugar, cornstarch, and salt. If making chocolate pudding, add cocoa powder. Very gradually a few tablespoons at a time whisk in milk, taking care to dissolve cornstarch. Whisk in egg yolks. When cook over medium heat until the first large bubble forms and sputters. Reduce heat to low; still whisking, cook 1 minute. Remove from heat; immediately pour through sieve into bowl. Stir butter and vanilla into hot pudding. Finally place plastic wrap directly on surface of pudding to prevent skin from forming chill at least 3 hours and up to 3 days. Before serving, whisk pudding until smooth; divide among four serving dishes. 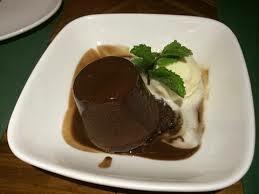 Serve this chocolate pudding any plate.When you want make chocolate pudding,then try home.